Invited Commentary: On Host Site Preservation and Augmentation for Single-Implant Replacement: Is Less More? Purpose: To report retro-prospective, long-term data on the prevalence of implant failures related to maxillary and mandibular arches and to different implant surfaces in a large number of edentulous patients. Materials and Methods: Altogether, 3,493 and 1,092 edentulous arches were consecutively treated with implants with turned (1986-2002) or moderately rough (2003-2015) surfaces, respectively, during two time periods at one referral clinic. All implant failures were consecutively identified during routine follow-up, and a multivariate logistic regression analysis was performed to analyze implant failure related to arch and implant surface. Results: Overall cumulative survival rates (CSR) for arches treated with turned surface implants were 75.7% and 94.6% for the maxilla and mandible, respectively. The corresponding 10-year CSRs for arches treated with implants with a moderately rough surface were 91.9% and 96.1%, respectively. The strongest significant association (P < .05) with risk for implant failure was the maxilla, and this was more pronounced for implants with a turned surface. Age at surgery, implant surgeon, calendar year of surgery, and time of follow-up also had significant associations with risk of implant failure (P < .05). Conclusion: Risk for implant failure was significantly higher for treatment in the maxilla, but this risk was decreased significantly when using implants with a moderately rough surface. The impact of surface was not so obvious for treatment in the mandible. Risk for late implant failures after the first year was lower for implants with a moderately rough surface in the maxilla, but this risk seemed to be comparable for the different surfaces in the mandible. This case history report highlights the possibilities and limitations of orthodontic molar intrusion using temporary anchorage devices (TADs) in the prosthodontic management of patients with compromised interarch distance. Purpose: To compare the prevalence of physical and sexual abuse in women with temporomandibular disorders (TMD) vs women without TMD. Methods: Forty women (age range 16-45 years) with idiopathic TMD were selected from the Occlusion Clinic at the Pontifical Catholic University of Rio Grande do Sul Faculty of Dentistry and were compared to 40 TMD-free women within the same age range. The Research Diagnostic Criteria for Temporomandibular Disorders (RDC/TMD) Axes I and II and the Sexual Abuse History Questionnaire (S/PAHQ) were used to collect data. Results: Women with TMD diagnosed with myofascial pain had higher levels of chronic pain grade, disability points, chronic pain intensity, depression, and nonspecific physical symptoms with and without pain (ie, somatization). Women with TMD were significantly less educated, had lower family income, and were older than women without TMD. They also had significantly older partners, but there were no differences in the partners' occupation or education levels. Regarding emotional abuse, women with TMD reported significantly more insults and diminishing/humiliation in front of other people than the controls. The prevalence of physical and sexual abuse was higher in the TMD group, but this difference was nonsignificant. Conclusion: Emotional abuse, more than physical and sexual abuse, is an important risk factor for the development of TMD, even when controlling for education level, income, age, ethnicity, marital status, and occupation. Emotional abuse, as well as physical and sexual violence, should be assessed routinely in women suffering from chronic TMD. The prosthetic restoration and dental long-term care of two oligodont male cousins suffering from X-linked hypohidrotic ectodermal dysplasia is described in two case histories. The first patient was provided with three removable prostheses between ages 5 and 12, and the second patient was restored twice by tooth- and implant-supported dentures within an observation period of 10 years. In both patients, implants were placed in the growing jaw (both arches) in order to enhance denture retention by single attachments and/or a palatinal bar. In one patient, loss of one maxillary implant occurred 3 years after implant exposure and 2 years after the provision of the implant-supported denture. In the second patient, after completion of growth and preceding bone augmentation, further implants facilitated an improved removable maxillary restoration. In both patients, an orthodontic alignment and reshaping of the conical anterior teeth by means of resin or full-ceramic crowns was applied to improve the esthetic appearance. Patients with HED require a consistent lifelong attendance comprised of oral hygiene, denture maintenance, and refitting. In oligo-/anodont children, the placement of implants in selected regions may be useful for the enhancement of denture retention. However, due to poor bone quality and volume, implant failure may occur. Purpose: This preliminary case series report sought to evaluate the efficacy of an immediate loading protocol for mandibular overdentures retained by two mini-implants with the outcome measures patient satisfaction, masticatory cycles, and masticatory efficiency at 1 year. Materials and Methods: A convenience sample of 11 patients was recruited, and the clinical protocol consisted of immediately loading two mini-implants (10 mm long and 2.4 mm or 2.9 mm in diameter) via a mandibular overdenture connection with Locator attachments. Each patient completed a satisfaction questionnaire and underwent masticatory cycle recordings and masticatory efficiency tests. Implant-related evaluations were carried out by assessing probing depth (PD), Plaque Index (PI), bleeding on probing (BOP), mobility, and pain. All tests and evaluations were carried out six times: before implant surgery (T0), just before implant surgery with patient under anesthesia (T1), following implant insertion with patient still under anesthesia (T2), and at 3 months (T3), 6 months (T6), and 1 year (T12) after implant insertion. Results: Implant survival rate was 95%, and statistically significant increases (P < .05) in masticatory cycle patterns, masticatory efficiency, comfort, stability, and phonetics were also recorded. Conclusion: The employed treatment protocol suggests promise as a viable treatment option that in the short term provides improved prosthesis stability, comfort, and function while decreasing surgical invasiveness. Long-term follow-up outcomes in larger patient sample studies will be required to confirm and validate the merits of this preliminary report. Purpose: To study the evolution of recent topics in maxillofacial prosthetics (MP) research. Materials and Methods: Science mapping analyses were used to measure bibliometric similarities among articles extracted from the Web of Science from the last three decades. Results and Conclusion: Keyword co-occurrence highlighted the rise of computeraided design/computer-assisted manufacturing, mandibular reconstruction, and extraoral prostheses during the last decade. Citation analysis showed that surgery journals kept the leadership on MP publications, but that prosthodontics journals were closing the gap. The United States was the leading country in MP publications over the last three decades, but their lead is fast dissolving worldwide. Purpose: To clarify the effect of geniohyoid (GH) muscle morphology and related function on masticatory ability using a decision-tree analysis. Materials and Methods: A total of 103 participants were enrolled. A cross-sectional area (CSA) of the GH muscle, neck circumference, body mass index, tongue pressure, jaw opening strength, and masticatory ability score were measured. The CSA of the GH muscle was selected as an independent variable for the first layer of the decision tree, with masticatory score as the dependent variable. Results and Conclusion: These data suggest that the CSA of the GH muscle may have a large impact on the masticatory ability score when evaluating masticatory ability. The fibular free flap (FFF) approach is the preferred option for reconstruction of segmental mandibular deficiencies. Fixed dental prostheses are recommended for patients who have undergone FFF jaw surgery to improve quality of life, but treatment of these patients with an implant-supported prosthesis is challenging because of the thin bone and thick soft tissue in the fibula. This case history reports the use of a bone-level implant guide fabricated with a computer-aided system and milled customized long abutments for implant placement and prosthodontic procedures. Advanced digital technologies can facilitate jaw rehabilitation in patients with bone flap. Purpose: To evaluate patient perception and operating time of digital (DW) and conventional (CW) workflows for the rehabilitation of a screw-retained, single-implant crown. Materials and Methods: A convenience sample of 10 patients with single implants in posterior sites was recruited for treatment with screw-retained single crowns, fabricated with either a DW or a CW protocol. Operating time and clinical adjusting time were recorded with a stopwatch, and patient preference and self-perception of the esthetic outcome were evaluated with a visual analog scale. Results: The mean operating time for the DW crowns was 16:21 minutes and for the CW crowns was 28:28 minutes. The mean total adjustment times were 118.1 seconds for the DW protocol and 181.5 seconds for the CW protocol. The mean score regarding self-perception of the esthetic outcome was 73 for DW crowns and 69 for CW crowns; for discomfort, the mean score was 15.5 for DW and 62 for CW. Conclusion: The DW approach resulted in a time reduction for both the impression phase and operative time. Purpose: To estimate implant survival and peri-implant bone resorption around long vs normallength implants in full-arch immediate loading rehabilitation of maxillary arches of low bone quality (D4). Materials and Methods: A total of 45 patients received two mesial normallength (10 to 15 mm) or longer (18 to 20 mm) implants and two long (18 to 20 mm) distally tilted implants. Differences in bone resorption at 24 months were assessed using the Mann- Whitney U Test. Results: At the 24-month follow-up, no significant differences were found in survival (global cumulative survival rate: 98.9%) or bone resorption (mean: 1.1 mm) between long and normal implants (P = .053). Conclusion: At 24 months, the use of long implants provides favorable survival and bone maintenance results in the immediate loading rehabilitation of low-quality maxillary arches. When soft palate defects lead to palatal insufficiency, the patient's quality of life is affected by difficulties swallowing, hypernasality, and poor intelligibility of speech. If immediate surgical reconstruction is not an option, the patient may benefit from the placement of a rigid obturator prosthesis. Unfortunately, the residual muscle stumps are often unable to adequately move this stiff and inert obturator to properly restore the velopharyngeal valve function. In the present case history report, a new membrane obturator concept is described: Using a dental dam to compensate for the soft palate defect, swallowing and speech were significantly improved. Purpose: To evaluate the biomechanical behavior of implants with different neck designs. Materials and Methods: Finite element models of implants with two different neck designs (OsseoSpeed EV and OsseoSpeed Profile EV) were generated. Implants and abutments were subjected to buccally and lingually directed 30-degree oblique loads of 200 N.
Results: Under buccally angulated load, the Profile implant model showed lower minimum principal stress when compared to the standard implant model (-63.4 vs -91.9 MPa), whereas the von Mises stress value of the Profile implant model was higher (342 MPa). Conclusion: This preliminary study showed that Profile implants placed in alveolar ridges with buccolingual bone height discrepancy showed similar stress distribution and stress value outcomes when compared to standard implants. Purpose: To determine whether selective laser melting (SLM) is suitable for the fabrication of dental superstructures. Materials and Methods: Mechanical properties of Ti-6Al-4V, manufactured with SLM or numerically controlled milling, were evaluated and compared. Results and Conclusion: Both groups showed a mechanical strength greater than 500 MPa and an elongation greater than 2%, as required by the International Organization for Standardization 22674 standard. However, a reduced ductility was observed for SLM samples. Purpose: The aim of this study was to assess the frequency and location of positive radiographic findings in edentulous patients and to evaluate the oral health-related quality of life (OHRQoL) and complacency of patients with positive radiologic findings. 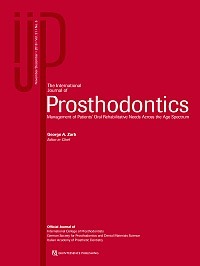 Materials and Methods: A total of 1,349 asymptomatic edentulous patients were retrospectively evaluated using a digital panoramic system for the presence of retained root fragments, impacted teeth, foreign bodies, radiolucencies, radiopacities, mental foramen at or near the alveolar crest, and maxillary sinus pneumatization. The patients with positive findings were called for a follow-up to take a new panoramic radiograph. The functional status and symptoms of participants were measured with the Oral Health Impact Profile (OHIP-14). Results: At least one or more of the radiographic findings were observed in 35.21% of the evaluated radiographs. The most frequent finding was sinus pneumatization (20.9%). The mean total OHIP score was 9.74 ± 8.34. There was no statistically significant difference observed for gender, age, education levels, marital status, or having surgical interventions for total OHIP- 14 scores (P > .05). Conclusion: The results of this study suggest that routine radiographic examination of edentulous patients may not be crucial before rehabilitation, and using a total percentage of positive radiographic findings may result in the exaggeration of the disease risk in edentulous patients. Purpose: To evaluate the feasibility and accuracy of noncontact three-dimensional (3D) digitization systems for capturing facial defects. Materials and Methods: A stone model of a facial defect was digitized using high-accuracy industrial computed tomography as a reference scan. The model was also scanned using four different types of noncontact 3D digitizers: a laser beam light-sectioning technology with camera system and three different stereophotogrammetry systems. All 3D images were reconstructed with corresponding software and saved as standard triangulated language (STL) files. The 3D datasets were geometrically evaluated and compared to the reference data using 3D evaluation software. Kruskal-Wallis H tests were performed to assess differences in absolute 3D deviations between scans, with statistical significance defined as P < .05. Results: The four noncontact 3D digitization systems were feasible for digitizing the facial defect model, although the median 3D deviation of the four digitizers varied. There was a significant difference in accuracy among the digitizers (P < .001). Conclusion: Digitization of facial defect models using various noncontact 3D digitizers appears to be feasible and is most accurate with laser beam light-sectioning technology. Further investigations assessing digitization of facial defects among patients are required to clinically verify the results of this study. Purpose: To assess the illuminant metamerism of three different pigments used for maxillofacial prostheses under three different illumination sources and to standardize subjective shadematching and observation protocols. Materials and Methods: Nine silicone shade tabs were constructed for three volunteers who had light, medium, and dark skin tones using make-up, oil paint, or silicone pigments (three shade tabs per volunteer). A shade recipe was recorded during session one, and further tabs were constructed by following the recipe at two subsequent sessions. Using an observation protocol, expert examiners rated the shade match under three different illuminants. Results: The intra-rater and inter-rater reliability revealed acceptable reliability (ICC > 0.6). Two-way analysis of variance revealed significant differences (P < .05) for pigments and illuminants and for the interaction of pigments with illuminant on the raters' scores. Conclusion: Illuminant metamerism affected the appearance of the silicone shade tabs. Oil paint with fluorescent or incandescent illumination had the worst effect. It was found possible to construct a consistent shade guide and to recommend an observation protocol, which should be repeatable if similarly experienced examiners are used. Foucher, France / Mainjot, Amélie K.
Functional and esthetic oral rehabilitation of young patients affected by ectodermal dysplasia is traditionally performed with direct composite restorations, which encounter various limitations. However, recent advances in computer-aided design/computer-assisted manufacturing (CAD/CAM) composites have led to the introduction of high-performance materials. In the present case report, a 9-year-old patient was treated with 20 CAD/CAM partial and peripheral restorations in polymer-infiltrated-ceramic-network material to restore deciduous and permanent teeth. The restorations were minimally invasive, since they did not require any tooth tissue preparation. Appropriate occlusal relationships with increased vertical dimension of occlusion were obtained. Tooth anatomy and esthetics were significantly improved, and chairtime was reduced. Purpose: To assess the amount of contamination remaining on used healing abutments after autoclaving and to compare the effectiveness of two additional decontamination methods. Materials and Methods: After autoclaving, a total of 120 used healing abutments were divided equally into three groups: used healing abutments after autoclaving only (group 1); used healing abutments after autoclaving and air-flow polishing (Master Piezon, EMS) using erythritol powder (AIR-FLOW PLUS, EMS) (group 2); and used healing abutments after autoclaving and sodium hypochlorite (NaOCl; 25 g/L) treatment (group 3). Residual contaminants were stained using Phloxine B (400 g/mL), and healing abutments were photographed using a light microscope with digital capture system (Nikon SMZ800). The proportion of stained (ie, contaminated) areas on each healing abutment was then measured using imaging software (ImageJ). The healing abutments were also examined using scanning electron microscopy (SEM). Results: Mean proportion of surface area affected by residual contaminants on the body, top (screwdriverengaging), and bottom (implant-abutment interface) surfaces for group 1 was 38.2% ± 28.34%, 30.0% ± 19.55%, and 18.7% ± 17.87%, respectively; group 2 showed 3.5% ± 4.90%, 5.3% ± 3.74%, and 5.4% ± 8.49%, respectively; and group 3 showed 0.3% ± 0.16%, 1.9% ± 2.14%, and 0.7% ± 1.02%, respectively. Autoclaving alone was insufficient for successful decontamination, while additional decontamination procedures significantly reduced remaining contaminants. NaOCl was significantly more effective than air polishing. SEM analysis showed no detectable differences in the surface appearance of titanium healing abutments. Conclusion: The results show that decontamination of used healing abutments is achievable, thus strengthening the feasibility of reusing healing abutments. Purpose: The purpose of this study was to determine the optimal positioning of implants for maxillary implant-supported overdentures (MIODs) using finite element analysis (FEA). Materials and Methods: Three-dimensional (3D) finite element models were built incorporating the maxilla, mucous membrane, removable denture, and artificial teeth using FEA software. Four models were prepared: one without an implant; one with two implants in the region of the lateral incisor; one with two implants in the first premolar region; and one with four implants in the lateral incisor and first premolar regions. Occlusal load was applied to the model, and denture displacement and the distribution of stress in the surrounding bone and mucous membrane were observed and measured. Results: The maximum equivalent stresses to the bone and mucous membrane were highest in the premolar and anterior areas, respectively. Stress to the bone was concentrated around the implants, whereas stress in the mucous membrane was concentrated along the posterior margin. Denture displacement in the anterior direction was highest in the model without implants, while denture displacement in the posterior direction was less affected by the presence of implants. Overall, denture displacement in the four-implant model was smaller than that in the other models. Implant angle affected the stress distribution, with highest stress to the bone when the implant was positioned in a palatal direction and highest stress to the mucous membrane when placed mesially. However, implant angle had little impact on denture displacement, with almost the same stress for implants at all tested angles. Conclusion: Optimal implant position can stabilize overdentures and reduce stress to the bone and mucous membrane. Stress is reduced when implants are inserted in the premolar area and when the direction of the implant is perpendicular to the occlusal plane. Al-Madi, Ebtissam M. / Al-Saleh, Samar A. / Al-Khudairy, Reem I. / Aba-Hussein, Taibah W.
Purpose: To determine the influence of iatrogenic gaps, type of cement, and time on microleakage of cast posts using spectrophotometer and glucose filtration measurements. Materials and Methods: Forty-eight single-rooted teeth were divided into eight groups of six teeth each. Teeth were instrumented and obturated, and a cast post was fabricated. In addition to two control groups (positive and negative), a total of six groups were prepared: In four groups, an artificial 2- to 3-mm gap was created between post and residual gutta percha (GP), and two groups were prepared with intimate contact between post and residual GP. Posts were cemented with either zinc phosphate cement or resin cement. Leakage through the post after 1, 8, 14, and 20 days was measured using a glucose penetration model with two different reading methods. Mixed analysis of variance tests were performed to analyze the data. Results: The presence of a gap between the apical end of the post and the most coronal portion of the GP remaining in the root canal after post space preparation increased microleakage significantly. However, microleakage was significantly less when the gap was refilled with GP compared to no gap. There was no difference in leakage between luting cements used. Conclusion: It was concluded that none of the cements were able to prevent microleakage. However, the addition of GP to residual GP did increase the sealing ability.